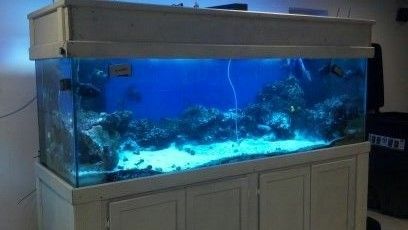 96″ x 30.5″ x 30.5″ Glass Oceanic Reef Tank (2 large black overflows / one in each rear corner), Wood Stand, Wood Canopy. I have never owned it, my site is for entertainment only, I don’t sell them. Will it fall through you floor? For sure! 8.5lbs/gallon + equipment!